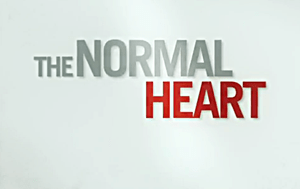 The Normal Heart is a largely autobiographical 1985 play by Larry Kramer which debuted Off-Broadway and now, almost 30 years later been adapted for the screen by HBO Films. It focuses on the rise of the HIV-AIDS crisis in New York City between 1981 and 1984, as seen through the eyes of writer/activist Ned Weeks (Mark Ruffalo), the gay Jewish-American founder of a prominent HIV advocacy group. Ned prefers loud public confrontations to the calmer, more private strategies favored by his associates, friends, and closeted lover Felix Turner (Matt Bomer), none of whom is prepared to throw himself into the media spotlight. Their differences of opinion lead to frequent arguments that threaten to undermine their mutual goal. After The Normal Heart finally opened on Broadway in 2011, Larry Kramer personally passed out a dramaturgical flyer detailing some of the real stories behind the play’s characters. Kramer wrote that the character “Bruce” was based on Paul Popham, the president of the GMHC from 1981 until 1985; “Tommy” was based on Rodger McFarlane, who was executive director of GMHC and a founding member of ACT UP and Broadway Cares; and “Emma’ was modeled after Dr. Linda Laubenstein, who treated some of the first New York cases of what was later known as AIDS. Like “Ned,” Kramer himself helped to found several AIDS-activism groups, including Gay Men’s Health Crisis(GMHC) and AIDS Coalition to Unleash Power (ACT UP), and indeed experienced personal conflict with his lawyer brother, Arthur. AFA Hate Group’s Don Wildmon Makes Insane Predictions for Year 2060: Christians Are DOOMED!